Florence, Italy is home to some very famous creations: Michelangelo's art and architecture (we all know the David), The Duomo, Gucci, and of course, my favorite Italian cocktail: the Negroni. 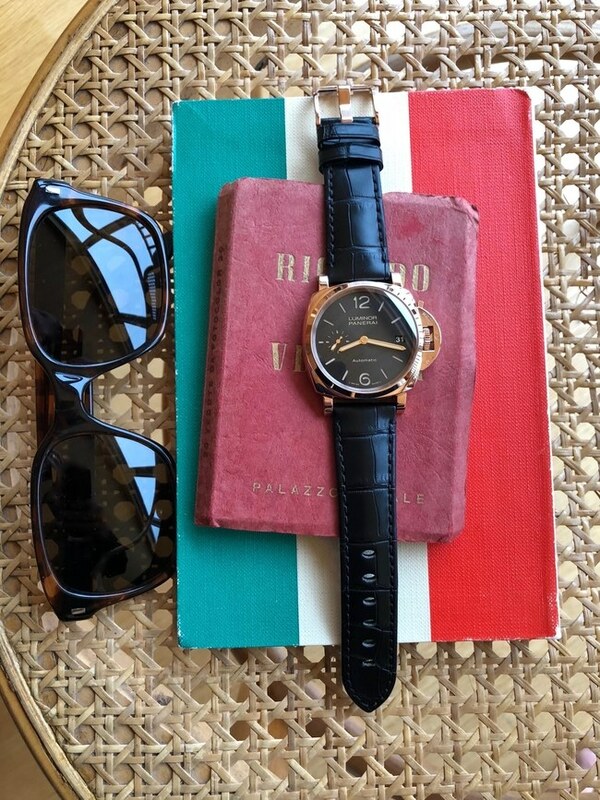 Perhaps not so well known is that Panerai watches trace their roots back to Florence as well. It was there that Giovanni Panerai set up shop and made some of his first military diving watches for the frogmen of the Royal Italian Navy, expanding in 1900 to the same building (14R) on the Piazza Giovanni that watch-lovers flock to today. This week in Florence, I am quite taken by Panerai’s latest interpretation of their classic dive style watch design. Called the Luminor Due 3 days Automatic Oro Rosso (or the PAM00908, if we're getting technical) the normally beefy Panerai, with case sizes up to 45 mm, has scaled down to an elegant 38 mm with a stunning black dial and a rose gold case. I found the watch in this current smaller scale to be the perfect size, and a well-suited accessory for diving into the Mediterranean—or simply diving into an aperitivo, ideally at a bar near its birthplace on the piazza.